USGS Biologists release an otter back into the waters of Prince William Sound, Alaska. USGS biologist Lizabeth Bowen attaches a flipper tag to an adult sea otter. A small hole is made in the flipper and tags with unique color and number combinations are then attached with a clamp and screws. An anesthetized otter sleeps onboard a research vessel as biologists weigh, measure and collect blood and hair samples. The collected data will help scientists gauge the health of the otter population and nearshore ecosystem. It's wildfire season, and the effects aren't limited to the land. As major fires rage around the state, researchers this week released a study indicating wildfires damage the health of marine mammals, such as sea otters. Wildfires are a mixture of good and bad. They help regenerate plant growth, and clear out old sticks, logs and bark. At the same time they produce environmental pollutants, known as polycyclic aromatic hydrocarbons, or PAHs. These are left over when something isn't burned completely, like, cooking a steak over an open flame, for example. After a wildfire, these PAHs wash into streams and, eventually, out to the ocean. Lizabeth Bowen, a biologist with the U.S. Geological Survey has been studying the effects of the fallout from fire in several species. 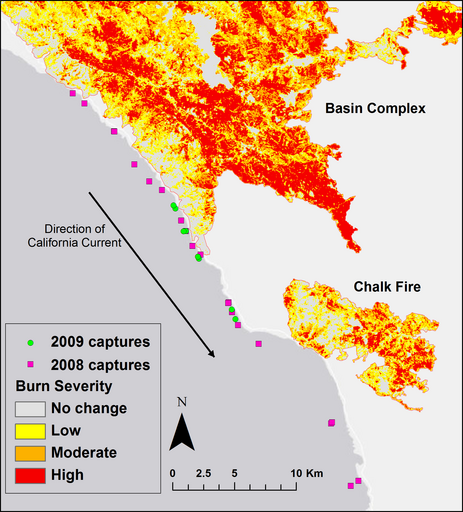 In 2008, just weeks before a planned otter capture survey, two major fires burned near the coast of Central California: the Basin Complex fire and the Chalk fire. One year later they re-captured otters in the same locations, allowing them to compare gene expression between the two conditions. When PAHs were in high concentration, following a fire, sea otter's immune system was suppressed, they found. The effect was similar to an oil spill. With a suppressed immune system, sea otters are less able to fight other pollutants or pathogens in the environment. "There's really nothing we can do to protect them [from wildfires]," says Bowen, "but it’s important information to know. When you start to manage a population, species or area, you need to think about what stressors you can mitigate when you have a wildfire come in."